(SOURCE) Prime Minister Benjamin Netanyahu on Sunday confirmed that Israel conducted an airstrike against Iranian targets in Syria over the weekend, which he said destroyed a number of weapons caches in the Damascus airport. “The Israel Defense Forces has attacked hundreds of Iranian and Hezbollah targets. 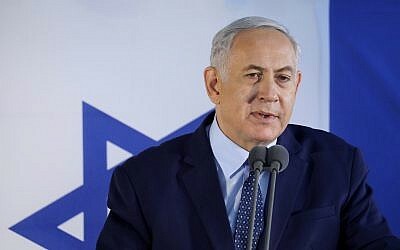 Just in the past 36 hours, the air force attacked Iranian depots full of Iranian weapons in the Damascus International Airport,” Netanyahu said, speaking at the weekly cabinet meeting in his Jerusalem office, in a rare acknowledgement of such a raid. During the meeting Sunday, the cabinet bade farewell to outgoing IDF chief Lt. Gen. Gadi Eisenkot. The prime minister praised the general for blocking Iran’s attempts to establish a permanent military presence in Syria. “We have operated — to impressive success — to block Iran’s military entrenchment in Syria,” Netanyahu said. “We acted against the manufacturing of precision weapons in Lebanon, we acted to destroy Hezbollah’s tunnel weapons in Lebanon with Operation Northern Shield, we acted against Hamas’s tunnels on the Gaza border, we have prevented hundreds of lone-wolf terror acts in Judea and Samaria, and we have carried out many more operations, both openly and hidden from view,” the prime minister said. 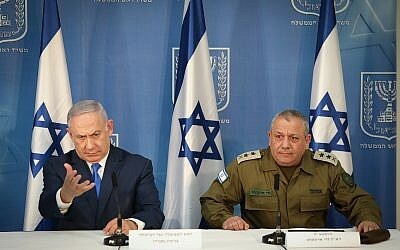 Eisenkot is due to end his four-year tenure as IDF chief on Tuesday, when he will be replaced by Maj. Gen. Aviv Kochavi. “I will have more to say at the official farewell ceremony, but at this stage, I will limit my comments to two words: Thanks, Gadi,” Netanyahu said. The official news agency SANA reported that Syrian air defense batteries opened fire on “hostile Israel missiles” and intercepted “most” of them, a common claim of the Syrian military, which many defense analysts believe to be false or overstated. The sites were near the airport and around the Kisweh area south of Damascus, the observatory said. A Syrian military source on Friday said that a “ministry of transport warehouse at Damascus International Airport” was targeted in the air raid. Another official told SANA that traffic at the airport had not been disrupted. On Saturday, Syria said it filed complaints with the UN Security Council and with UN Secretary-General Antonia Guterres over Israel’s alleged Friday night airstrikes. Damascus said Israel was able “get away with attacks against Syria” only because it is backed by the US, according to the Syrian foreign ministry. The previous such reported airstrike occurred on Christmas Day. 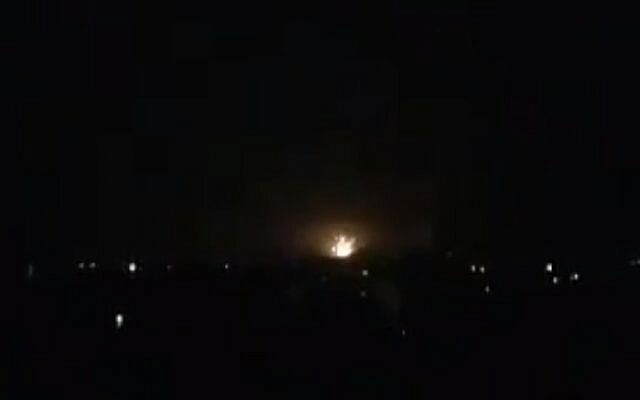 On that occasion, a Syrian anti-aircraft missile flew into Israeli airspace, and was destroyed by Israeli air defenses. Russia blamed the Israeli military for that incident — a charge rejected by Jerusalem — and has supplied Syria with the advanced S-300 air defense system. The systems were delivered to Syria late last year, but they are not yet believed to be in use, as the Syrian air defense teams still need to be trained to operate them. This entry was posted in Government, Iran, Israel, Middle East, Violence - Evil, World and tagged Israeli airstrikes against Iran, Middle East tensions rise by Gordon King. Bookmark the permalink.